Welcome to our weekly recap of new movie trailers that have debuted this week. Dive in for all the thrills, laughs, and first looks below! Nobody’s Fool stars Tiffany Haddish, Tika Sumpter, Omari Hardwick, Mehcad Brooks, Amber Riley and Whoopi Goldberg. The film is directed and written by Tyler Perry and marks his first film to be released under his new exclusive deal with Viacom. It will be released in theaters on November 2, 2018. After David Kim’s (John Cho) 16-year-old daughter goes missing, a local investigation is opened and a detective is assigned to the case. But 37 hours later and without a single lead, David decides to search the one place no one has looked yet, where all secrets are kept today: his daughter’s laptop. In a hyper-modern thriller told via the technology devices we use every day to communicate, David must trace his daughter’s digital footprints before she disappears forever. Searching debuts August 3. Life has become a balancing act for Adonis Creed. Between personal obligations and training for his next big fight, he is up against the challenge of his life. Facing an opponent with ties to his family’s past only intensifies his impending battle in the ring. Rocky Balboa is there by his side through it all and, together, Rocky and Adonis will confront their shared legacy, question what’s worth fighting for, and discover nothing’s more important than family. 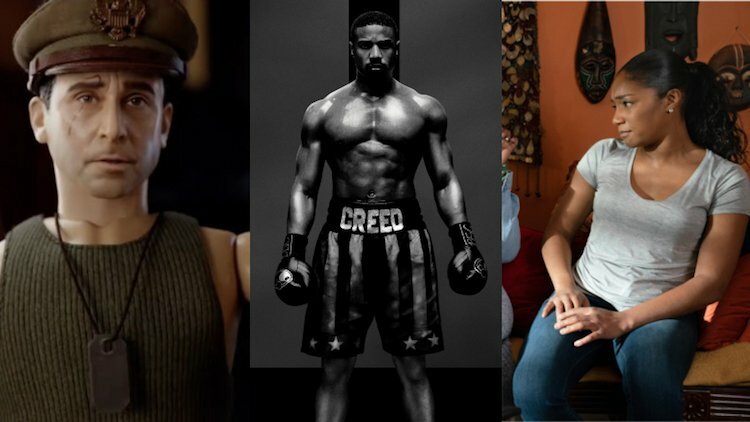 Creed II is about going back to basics to rediscover what made you a champion in the first place, and remembering that, no matter where you go, you can’t escape your history. The sequel enters the ring on November 21. This holiday season, Academy Award winner Robert Zemeckis — the groundbreaking filmmaker behind Forrest Gump, Flight and Cast Away — directs Steve Carell in the most original movie of the year. Welcome to Marwen tells the miraculous true story of one broken man’s fight as he discovers how artistic imagination can restore the human spirit. When a devastating attack shatters Mark Hogancamp (Carell) and wipes away all memories, no one expected recovery. Putting together pieces from his old and new life, Mark meticulously creates a wondrous town where he can heal and be heroic. As he builds an astonishing art installation — a testament to the most powerful women he knows — through his fantasy world, he draws strength to triumph in the real one. The film opens November 21. Jacob (Frank Grillo), a bank manager haunted by a violent heist that took the life of a coworker, teams up with his ex-cop neighbor James (Bruce Willis) to bring down the assailant. While the two men work together to figure out the thief’s next move, the highly-trained criminal Gabriel (Johnathon Schaech) is one step ahead. When Gabriel kidnaps Jacob’s wife (Olivia Culpo) and daughter, Jacob barrels down a path of bloodshed that initiates an explosive counterattack and brings all three men to the breaking point. Reprisal will be released in theaters and on demand by Lionsgate Premiere on August 31st, 2018. Blaze is inspired by the life of Blaze Foley, the unsung songwriting legend of the Texas outlaw music movement who spawned the likes of Merle Haggard and Willie Nelson. The film weaves together three different periods of time, re-imagining versions of Blaze’s past, present and future. The different strands explore his love affair with Sybil Rosen, his last dark night on earth, and the impact his songs and death had on his fans, friends, and foes. The braided storyline terminates in a bittersweet ending acknowledging Blaze’s profound highs and lows, as well as the impressions he made on the people who shared his journey. Directed by Ethan Hawke, the film debuts August 17.